Review! New Nomad Lounge Menu in Disney World’s Animal Kingdom! 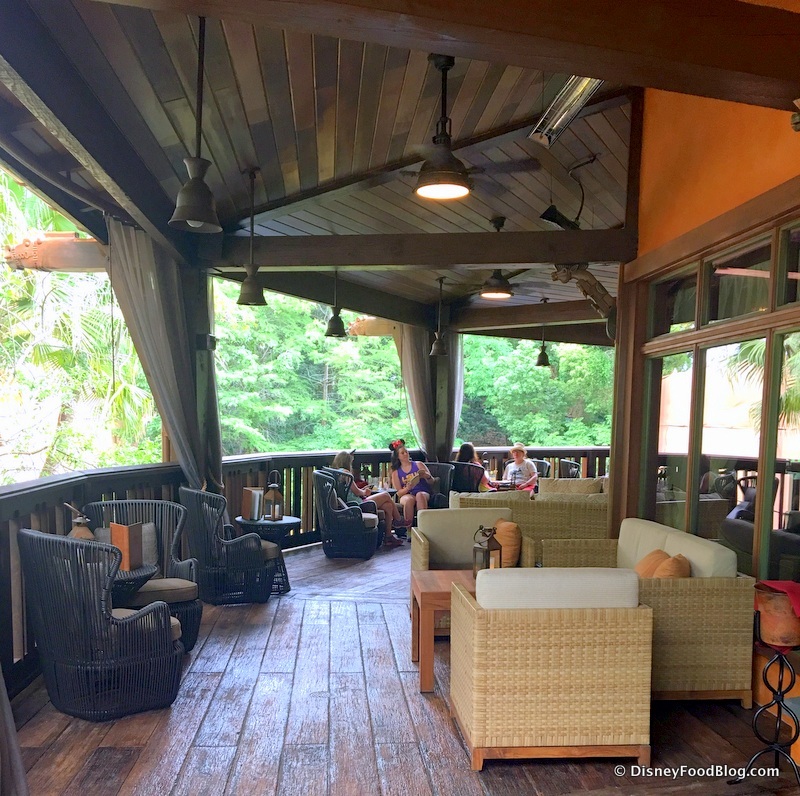 Nomad Lounge has called Animal Kingdom home for just over two years now. It shares a structure and opening date with Tiffins. Their menu is always changing, and on this visit I tried some favorites as well as new items. Nomad Lounge’s focus is on hand-crafted cocktails, non-alcoholic specialty drinks, and small plates. You’ll also find a broad selection of wines and beers, specifically from the African, Asian, and South American continents. 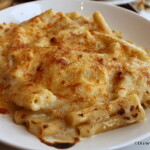 The flavors from these three regions also define much of their menu. 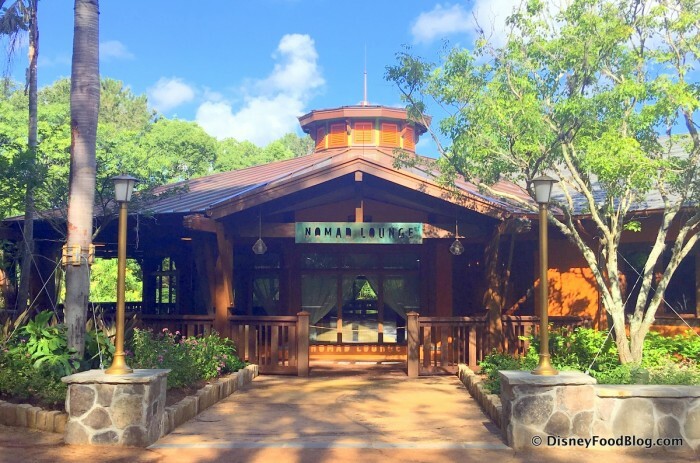 Nomad Lounge is in the same structure as Tiffins, and located in the Discovery Island section of the park. 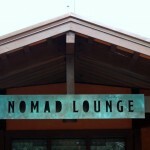 If you’re a nomad-at-heart, traveler, or have wanderlust this is a location designed with you in mind. The lounge is decorated with banners depicting reasons “Why I Travel”. It is worth taking the extra time to read and appreciate these. You have the option of indoor or outdoor seating. On this typically humid/rainy August day in Florida I opted for the indoor, air conditioned area. If you do sit outside you are treated to a great view. On this trip I tried some new menu items as well as some favorites – the Cheese Plate, Truffle Poutine (new) and Impossible™ Burger Sliders (new), and Churros. First up was the Cheese plate or more formally known as the “Selection of Artisanal Cheeses“. This was the perfect afternoon snack while the rains came down outside! 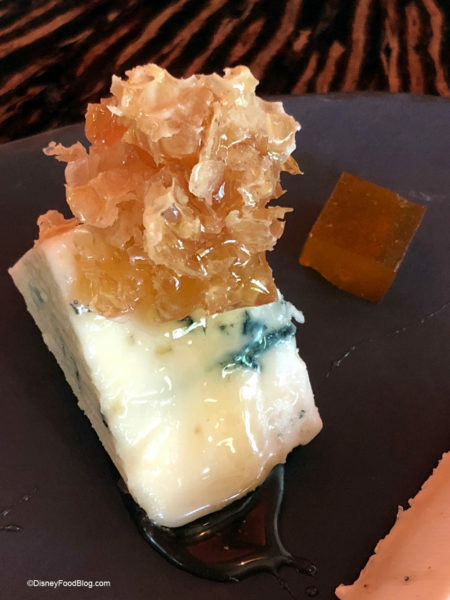 All of the options at present were delicious, but the Point Reyes (which seems to be the blue on many Disney cheese plates right now) was perfect with a nice drizzle of honey. I also liked the addition of the truffle cheese (next to the Point Reyes), which is also the cheese used on the poutine right now. It looks like Brie, but it has a stronger structure and, of course, flavor. 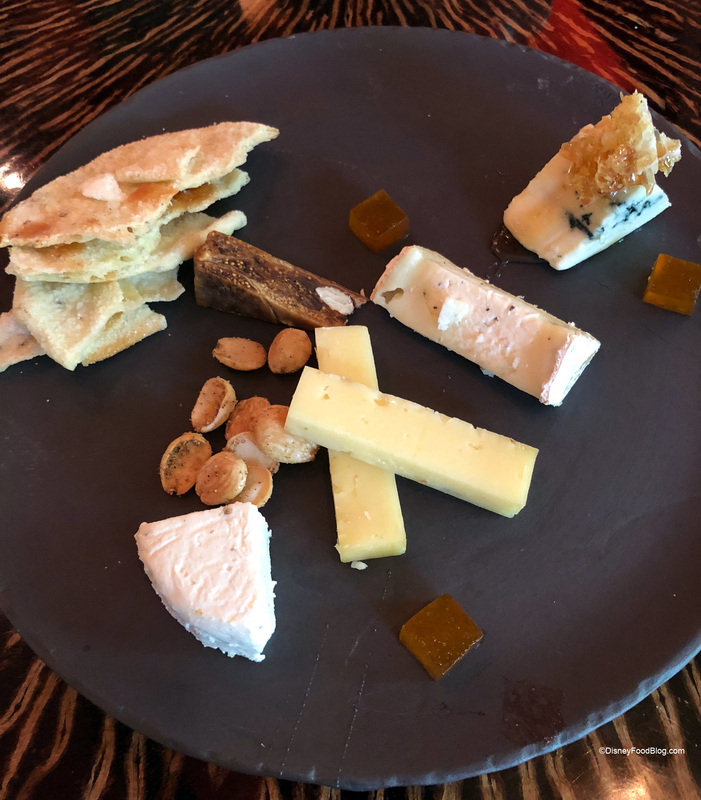 The cheese plate is served with toasted Naan bread, which had a serious sweetness to it. As always, don’t be afraid to ask for more bread! 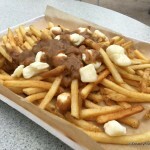 Next up was the new Truffle Poutine. This was really delicious…and very truffle-y. If you’re not a fan of truffle flavor or truffle oil, ask them to go easy on it when you order. The only down side was I felt it needed more cheese and gravy. 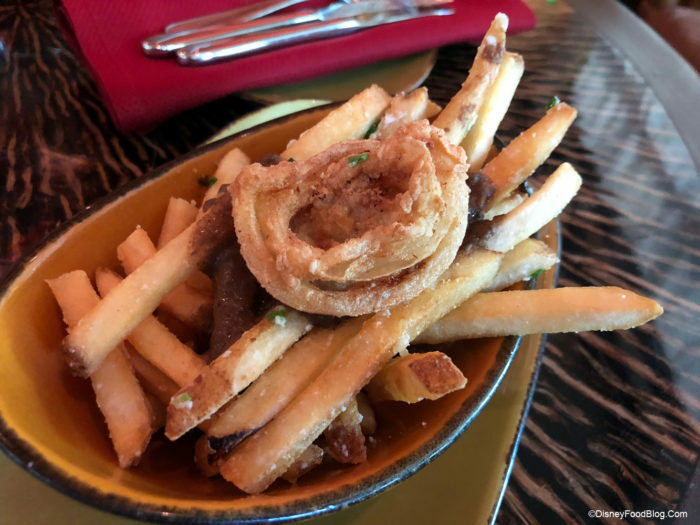 I was really missing the extra gravy that came with the House-Smoked Kobe Style Brisket Poutine that this menu item replaced…so I asked for more! It was no problem to get a small carafe of gravy to add on top. 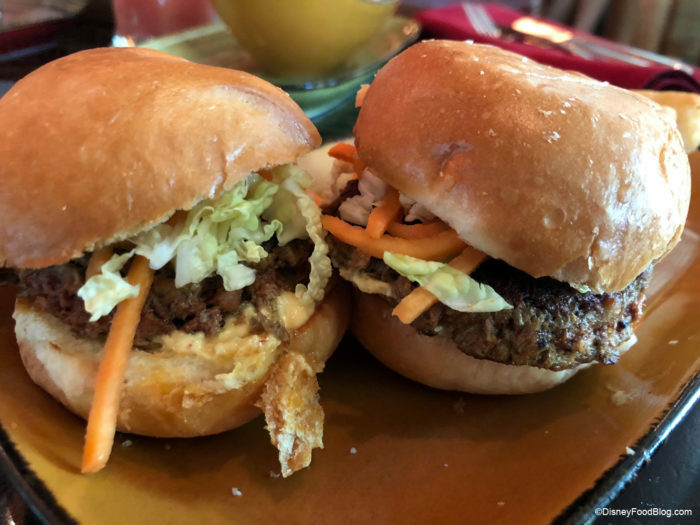 Next, I gave the new Impossible™ Burger Sliders a try. 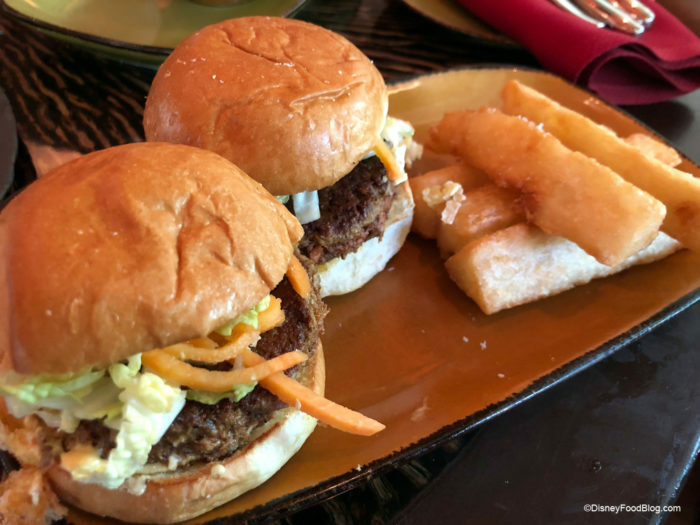 They were served with slaw and chipotle aioli, and Yucca fries on the side. EVERYONE loves these. But I’m not 100% sold. I liked the savory flavor of them — they had a strong saltiness. But mine were very dry and chewy. I think they could have used a bit more chipotle aioli. 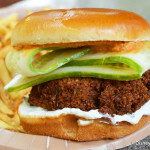 Overall, they’re a decent alternative to meat if you’re eating vegan or vegetarian, but I’m a fan of old-fashioned veggie burgers. The yucca fries were a good version of the dish — crispy and savory. So it was time to close out this visit with a little something sweet! And OH MY GOODNESS. These Churros are SO AMAZING. 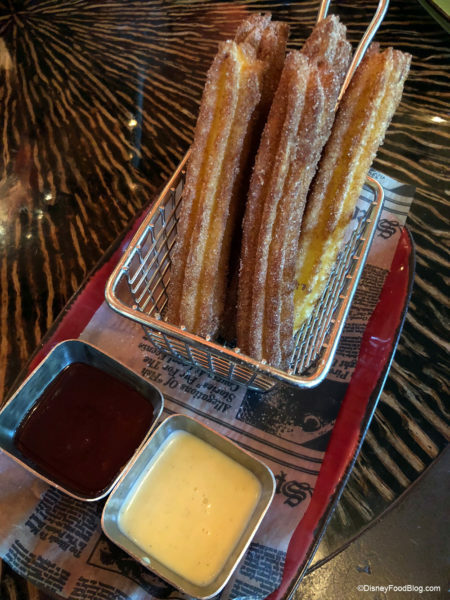 This is a generous serving of five churros (smaller than park churros in length) and comes with Vanilla Crema and Chili Strawberry dipping sauces. The Chili Strawberry sauce is sweet with some heat at the end. It’s basically like “Oh, this is just strawberry jam…BUT WOAH!” The Vanilla Crema is great for those who don’t want the heat in the Strawberry sauce. Both of the sauces were delicious on their own, and also really good together as well. Of course I needed a drink to wash all this down! 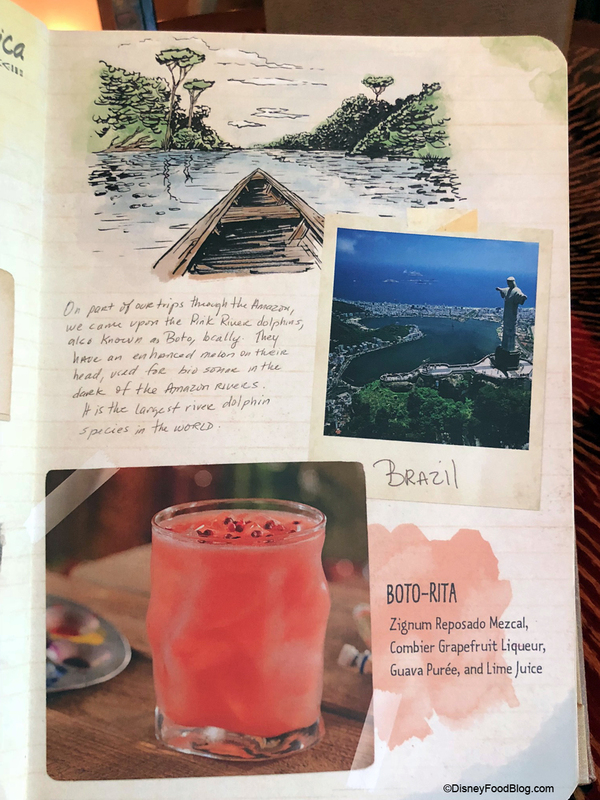 The menu carries the travel theme with it in its design with “travel notes” and photos, almost like a travel journal. I opted for the Boto-Rita, a margarita made with Mezcal, along with grapefruit liqueur, guava puree, and lime juice. 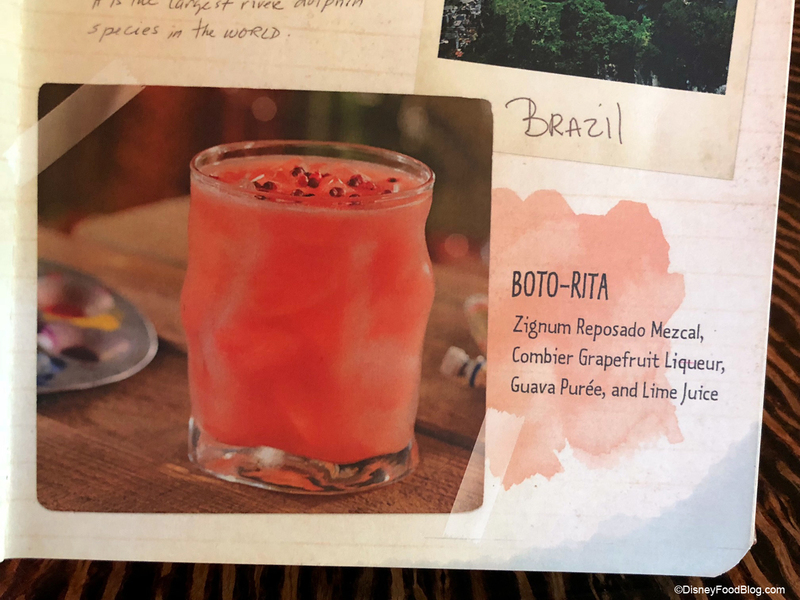 The drink looks just like the menu picture, which isn’t always the case. I found this a little too bitter and pulpy — and a bit spicy as well. I was expecting a more refreshing drink with the combination of grapefruit, guava, and lime flavors, but this was kind of heavy and “chewy” ha ha! It’s like a meal on its own, which would be fine if I just wanted a drink. But as an accompaniment to all of this food, it didn’t really work. 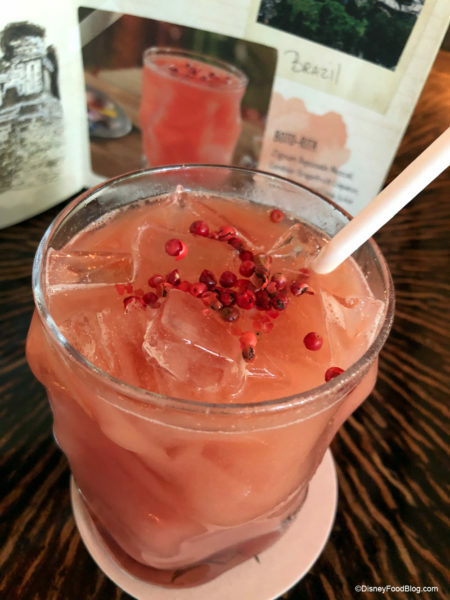 You love eats and drinks that are unique and not “run of the mill”. 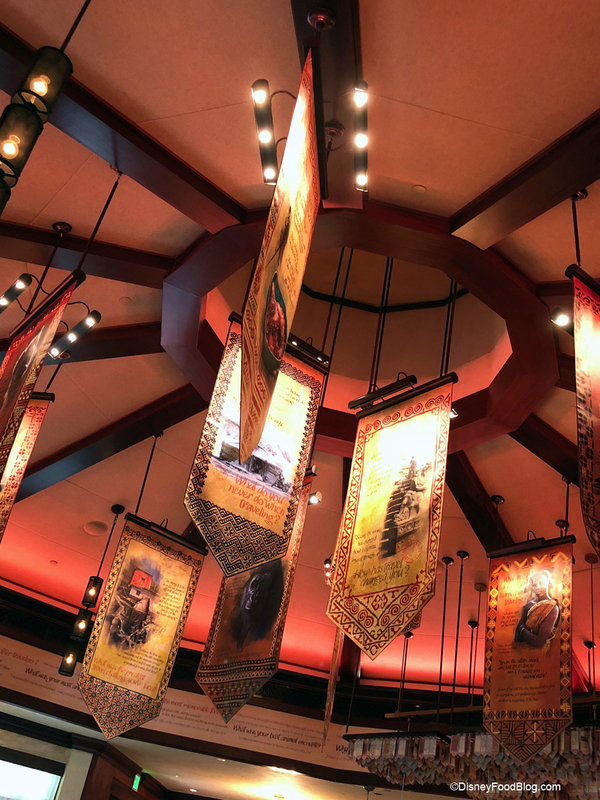 You are fascinated by the level of detail that Disney goes into with themes and decor. You just need to take a break, have a drink or food, and escape the park (or crowds) for a while. 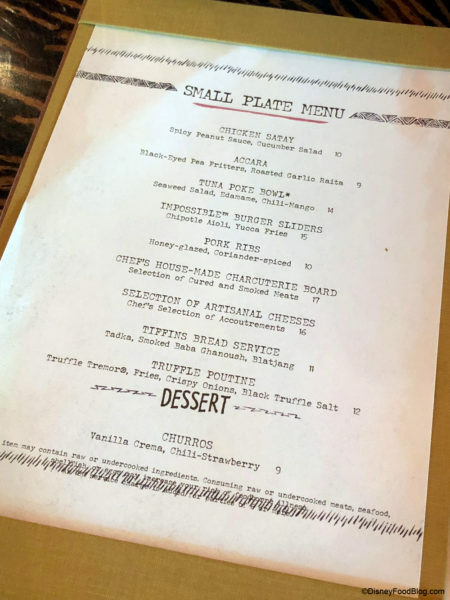 You’re looking for a more “complete” meal – these are small plates, which can be combined to make a satisfying meal, but some prefer a “larger” plate. You’re more into straight up snack/bar food. This is definitely small plates with a twist (think yucca fries instead of potato fries). 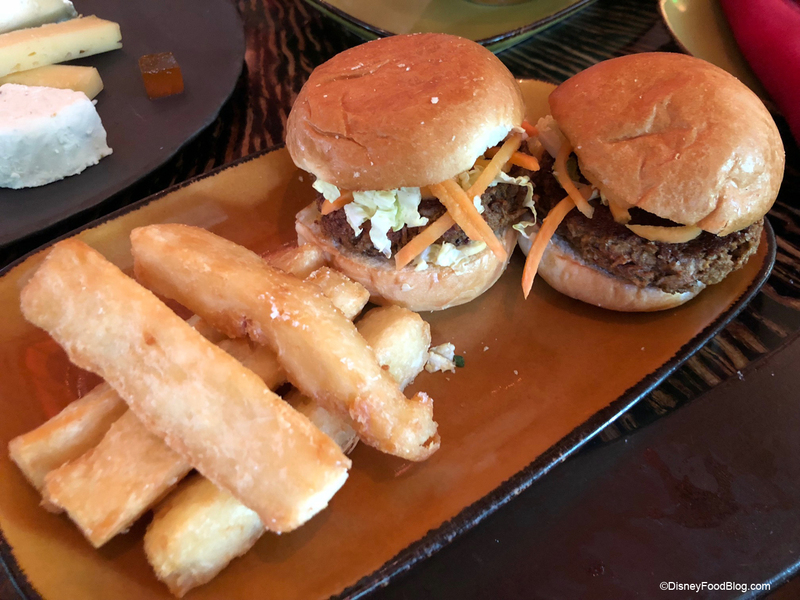 Nomad Lounge remains an ideal location to stop in for a while to relax and enjoy a drink and some snacks. The story being told in the decor is worth the stop as they have really gone above and beyond with the theme here. Whether you’re stopping in to dine or just look this is worth your time. 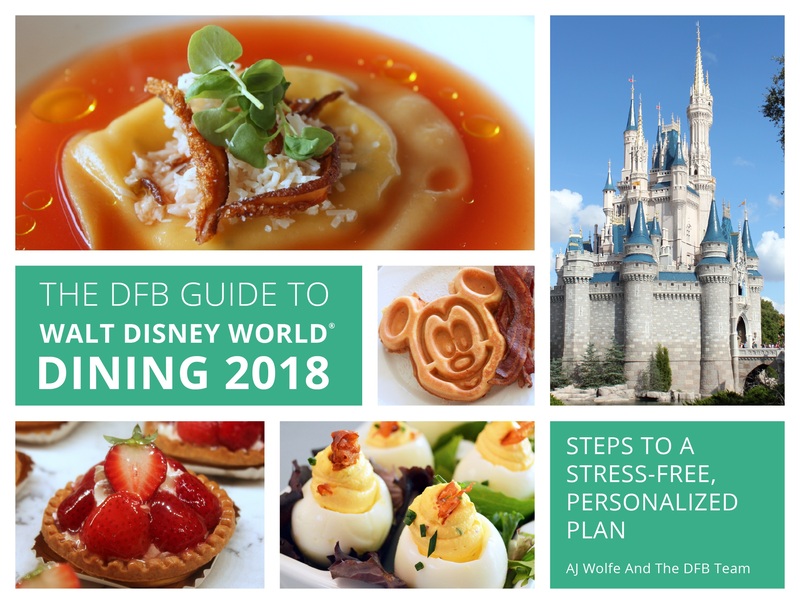 « Dole Whip Dress Debuts in Disney Parks! Oh Noooo……….I so wanted to hear the Impossible Sliders were Killer! 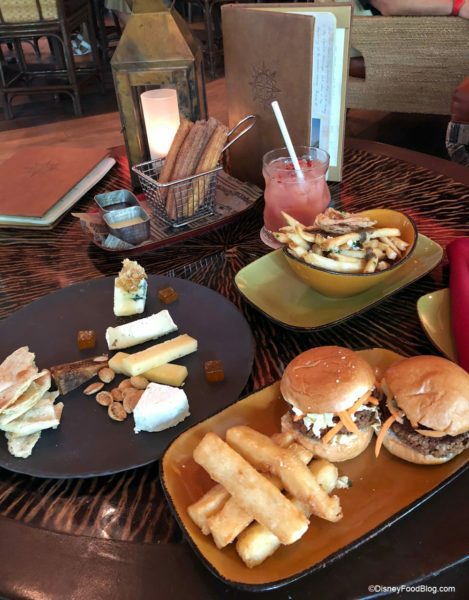 My family just visited the Lounge for the first time about 2 weeks ago and we loved it, too. We both also recalled, several years ago (4?) being given an opportunity to fill out one of the small ‘banner’ type cards that hang over the bar. We each answered a travel question on the card and returned them to a cast member. I looked for our cards over the bar, but there are (wonderfully!) so many, I couldn’t find ours. Neither of us had any idea at the time where they’d end up or what they’d be used for. I’m delighted by what Disney did with them. 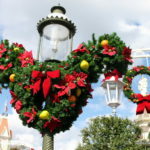 This is one of our favorite places in Disney World. Walking into this lounge truly feels like an escape from the park. 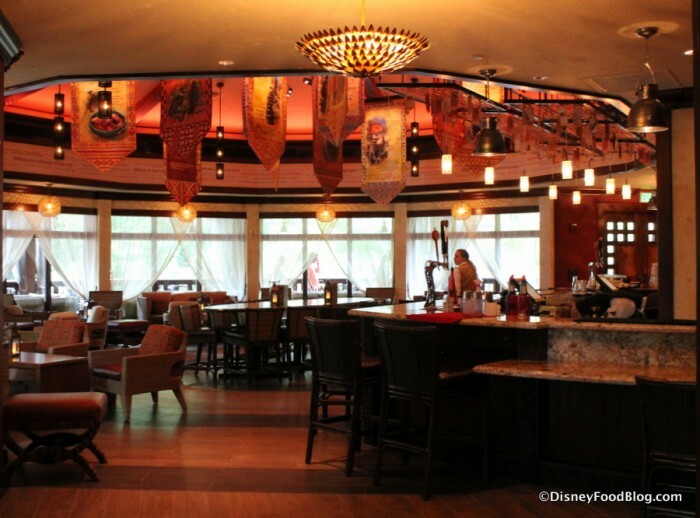 As passholders, we often come to AK just to hit up the lounge and then have dinner at Tiffins. I have to agree with you that I much prefer veggie burgers made of vegetables or beans. It is disappointing to see so many menus with ‘fake’ meat options. We are heading back to the World next summer and looking forward to trying Tiffins. Is it okay to take kids for early dinner? Suzanne, kids are absolutely welcome at Tiffins! Early dinner sounds great! This has become one of my favorite places in WDW. Beautiful seating inside and out, and the drinks and food are great. 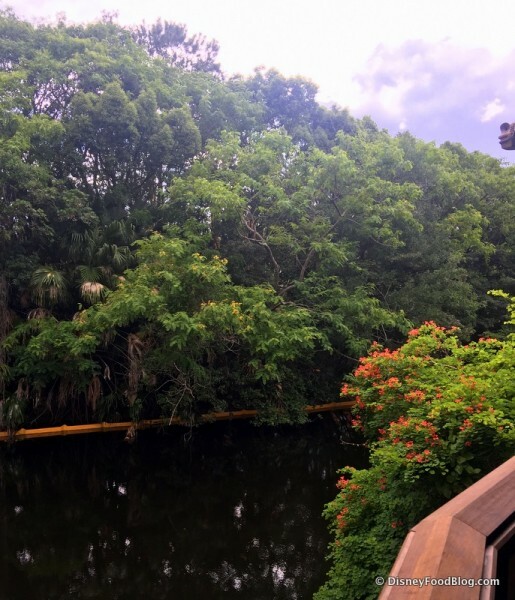 Super awesome place to relax, especially in the middle of a long and hot day Animal Kingdom.